This book looks at the roots of modern psychiatry, its theoretical approach to women, and what shifting trends in diagnosis tell us about its social underpinning. Arguing at both an epistemological and empirical level, Russell challenges the biological base of conditions such as schizophrenia, depression, premenstrual syndrome, anorexia, bulimia and female criminality. Denise Russell is Senior Lecturer in the Department of General Philosophy at the University of Sydney. 1. History of the relationship between Women and Psychiatry. 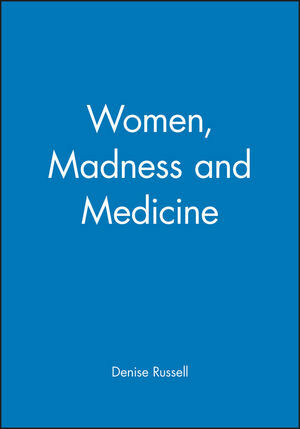 includes: Women encounter psychiatry; Psychiatrists and asylums; Nineteenth-century psychiatric theories of female madness. 2. Modern Psychiatric Perspectives on Women. includes: Psychiatric diagnosis and the interests of women; Problems with the conceptual foundations of the DSM-III-R; Problems wit subjectivity; Narrowness of focus; Personality disorders; Personality disorders and biological psychiatry; Personality disorders and child abuse; The medical profession responds to child abuse statistics. 3. Shifting Trends in Diagnosis. includes: Depression; Biological studies of depression and diagnosis problems; Research into the biological basis of depression; Is depression an illness? ; The sociological challenge to biology; Pre-menstrual syndrome (PMS) - defined? ; PMS: the causal research generates puzzles; Questions about the PMS diagnosis and its role in the discipline of women. 4. Epistemological Problems with the Dominant Medical Psychiatric Perspective. includes: Schizophrenia; Genetic studies of schizophrenia; Schizophrenia and body chemistry; Brain imaging studies of schizophrenia; Eating disorders; The biological research into eating disorders; Non-biological accounts of eating disorders. 5. Women, Psychiatry and Criminality. includes: Female crimes and appropriate female behaviour; Biological psychiatry and female crime; Pre-menstrual syndrome and female crime; Psychiatric legal defences and the interests of women; Battered woman syndrome and the law of self-defence. 6. Contrasting Feminist Philosophies of Women and Madness: Oppression and Repression. Examining the work of Phyllis Chesler and Luce Irigaray. 7. Women, Creativity, Reason and Madness. Examining the work of Virginia Woolf and Janet Frame. * An exciting and challenging examination of how women's minds are defined and treated by the medical establishment. * Whereas other books examine the history of mental illness in women, this book looks at the contemporary approaches of modern psychiatry. * An important contribution to feminist theory which argues for a new, feminist, approach to mental illness. * Written at an introductory level suitable for a range of students.